This is Gary's Special Order: "Nightmare"
The process of developing a special order pendulum means that we ask a lot of questions as we try to understand what kind of components will work best for the project. Sometimes it comes together very quickly...sometimes it takes a little longer. With his permission, we are sharing a bit of our experience with Gary Thompson. Gary had a very specific idea of what he wanted. He'd been designing a routine built around a tragic young girl, accused of witchcraft in Salem. He wanted the pendulum to look elegant , beautiful and and spooky all at the same time. The result is in the upper left corner. Out of respect to Gary, we won't share any details of his routine. But with his kind permission, we will tell you some of the specifics of his request. Gary wanted a dual bob that he could use to present his routine. He wanted something dark and attractive...but not like a Halloween toy. He described the main character of his story to us as a young girl, who stood accused of a crime. Since this took place a long time ago, obviously, a photo couldn't be used. The young woman in his effect has a first name starting with an "S". 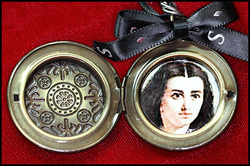 We started thinking: wouldn't it be great if the locket could take a load...and if the image of the young girl was inside? I found an image that would work and spent some time working on it in Photoshop. 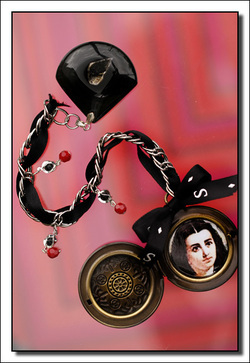 Then we thought: wouldn't it just be utterly AMAZING if something like a hair ribbon (imprinted with the letter "S": for the first letter of her name) was tied in a bow over top of the locket? Yes. It would be great. Actually it IS great -- from the Swarovski blood bead adornments to the loadable locket, to the crystals glittering inside the black rock. "The gauntlet was thrown to the ground ! The response was "Nightmare." "Dave and Sheree gave me back more than I ever expected! That was kind of a big (HUGE) request about Dark and Beautiful at the same time! "This was an enjoyable process. "They got on this right away , while performing and getting the site open! I can really say ...welcome to my "Nightmare" ! She is going to join the company of Rich's fine pendulums! "Thank you David and Sheree!